RACI is a simple method that is typically used during project startup, reorganization procedures or in the area of business process modeling (BPM) to describe how various roles (individuals or teams) participate in completing tasks or deliverables for a project or business process. RACI is also useful within the scope of analysis and the resolution of conflicts that may occur as a result of ambiguous role definitions in cross-functional/departmental processes. Who is involved in the project/process? What tasks does an individual/a team perform? What is the scope of activities? Is the performance of activities active or passive? The core of the method is the RACI matrix that enables you to visualize and document all relevant information. 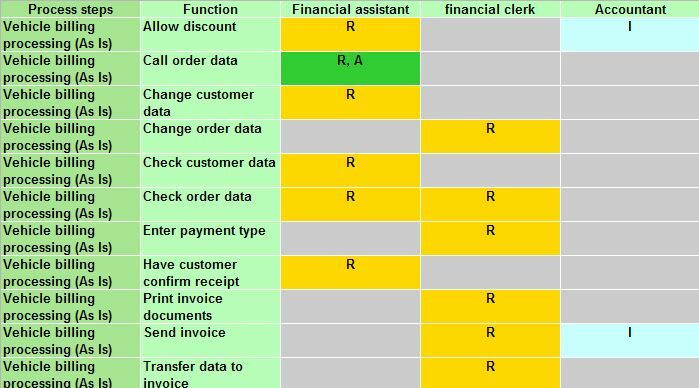 The RACI matrix records the activities in rows and the roles in columns. In the fields the responsibilities are indicated by the corresponding letter(s). R = Responsible - Person who is responsible for performing or delegating activities. More than one person can be responsible. A = Accountable - Person who is in charge of an activity in a legal or business sense. A single person is responsible for this kind of activity. C = Consulted - Specialist who gives advice. Advice can be given by more than one person. I = Informed - Person receiving information on the progress/result of an activity or having the authorizations required to receive information. Multiple project/process participants may have these authorizations. It is possible that one person has more than one responsibility for an activity, e.g., Responsible and Accountable.